Unrelenting faith and conviction in one's own abilities, and the supreme authority of God is a wonderful ingredient to inner happiness. In fact, this is one of the key ingredients to success in life, in a way most of us understand it. But we must understand what "unrelenting faith" actually implies. It is definitely different from "faith" that most of us know. I love the below example of unrelenting faith, which always gives me the self confidence to move on in life. This example is from Indian mythology. Most of us might know the story, but try and focus on the unrelenting conviction demonstrated by Angada. Angada, in the Indian Ramayana context, was a vanara who helped Rama find his wife Sita and fight her abductor, Ravana. In his efforts to seek a peaceful solution, Rama sent several messengers to Ravana, and Angada was one of them. Angada explained to Ravana that Rama had sent him as messenger to seek the release of Sita and that Ravana ought to heed this last appeal so that war could be averted. Angada tried every means to convince Ravana, but the ruler was dogged and firm to face a battle instead of returning Sita to Rama peacefully. At Ravana's court, after Angada explained the divinity of lord Rama and the message he carried, Ravana paid no heed to it. Angada then planted his foot firmly on the ground and challenged anybody in the courtroom to uproot his foot. If anybody were to accept the challenge and was successful, Rama would concede defeat and return without Sita. All the rakshasa commanders of Ravana's army and even his son Indrajit tried to lift Angada's leg but none succeeded. Feeling humiliated by this failure, an infuriated and powerful Ravana slowly walked towards Angada's planted foot and just as he was about to hold Angada's leg to attempt the challenge, Angada moved away and Ravana fell down. Angada explained that the challenge was for Ravana's commanders and not for Ravana. He told that Ravana was prepared to fall on his feet but instead he should choose to fall on the lord Rama's feet, for those are the ones that remove fear of cycle of life & death. .
At a later point in time, someone asked Angada that how could he make such a commitment on behalf of Shri Rama, and how could he be so confident that no one can lift his feet. "What if someone in Ravana's darbar actually was able to displace your feet" asked a stranger. "How can anyone?" said a confident Angada. "The foot that i had stay put was in remembrance of my lord - Shri Rama, so how can anyone even come even close to displacing it? ", he continued. Look at his faith in Lord Rama. The key is this faith. "What if Ravana had moved your feet?" asked the stranger. They key message that i always get from this story is the unrelenting, relentless, ruthless faith that Angada had on the power of Shri Rama's name. Now, don't just read the story and flip it over. Try and connect this story to your lives. 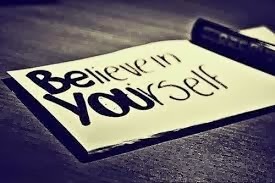 Do we have the same confidence in our own self and our own abilities? Or we keep doubting our abilities in the wake of adverse situations. Our boss fires us, and we start doubting whether we have the capability to perform the new role. We get an intuition to chase our dreams, but sooner than we can imagine, we come up with enough reasons to doubt our own abilities, and build enough walls around us not to chase our true calling in life. Each one of us can be a Angada for our own lives, and have the same unwavering confidence in our own abilities. You are destined to reach where you "think" you can. Knock down the walls around you, that you have only created, and let the inner self take over the charge of your life. You are destined to be a super hero, if only, you can have the same unrelenting faith in your own abilities, as much as Angada had on Shri Rama. "Always be yourself, express yourself, have faith in yourself, do not look for reasons on why it cannot be done, find ways on how it can be done." Read more about chasing your dreams and how happiness is linked to it. Chapter 6.13 ~ Challenge Your Beliefs - Happiness Unlimited (the book) - Launching April 2014.